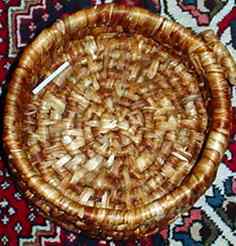 Ruth's twined black locust and day lily stem basket. 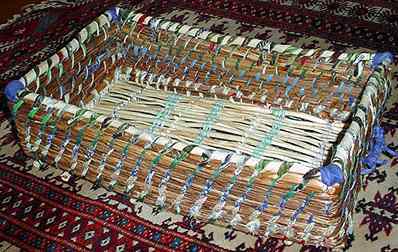 She says it is actually not all that tough to make this rectangular shaw, as the stalks are long and straight, and she used them dried to avoid shrinking. Looks hard to make to me! 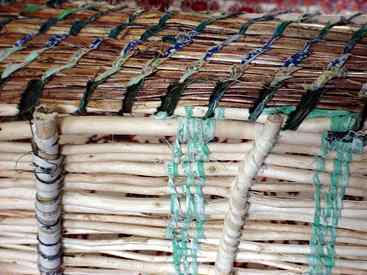 She put the upper layer of black locust on in hopes the walls would not be crushed, as a sort of "rim" for the basket. Iris leaves coiled around a cattail core, using an overcast stitch with wraps between, sometimes called the "Lazy stitch." 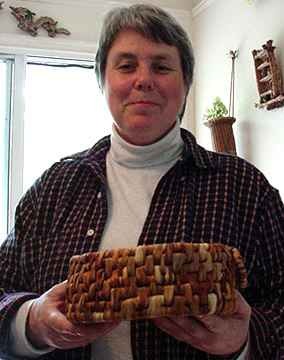 A lovely, challenging basket...how did you bind with all those iris leaves, Ruth? What a great job! 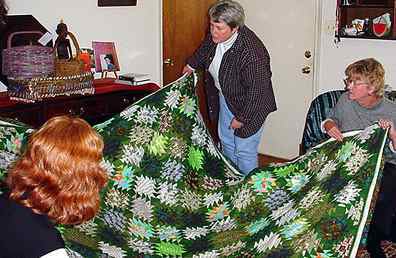 "The mag I got the pattern from called it pineapple, but I've seen it elsewhere as wild goose style log cabin so I don't know what it really is called..... you can see some of the clothes my mother and I wore back in the 60s and 70s--these are the remnants." Edie and Stephanie are helping to spread it out. 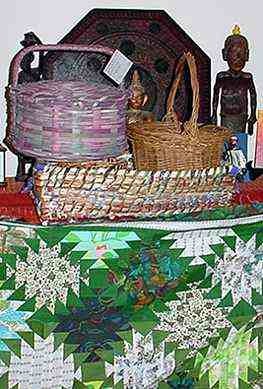 Ruth's quilt, along with her handmade baskets of willow, reed, catalpa pod and twined grass. 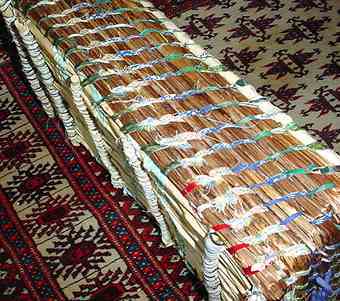 Back to The Basket Bunch.